It is recommended that every woman between the ages 25 years and 50 years should have a cervical smear every three years and every woman between the ages of 51 years and 64 years should have a cervical smear every five years. When you receive a letter from North Yorkshire and York NHS screening services inviting you to make an appointment please telephone your usual surgery and ask the receptionist for an appointment with the practice nurse. When you attend your appointment please bring a urine sample with you. The result of your smear will be sent to you directly from the screening services within six weeks. If you have not received your result within this time please contact the surgery. Pregnancy is a normal state and not an illness. Despite this, problems can sometimes arise, some of which might have been preventable. For this reason the Doctors are happy for patients to discuss a future pregnancy before it arises. This is a particularly useful time to check rubella status, dietary issues, and any other problems that you might wish to discuss. Our family planning trained nurses are also happy to provide pre-conceptual advice and education. An integrated system of shared care is available in the Scarborough district with close co-operation bet ween the Hospital, General Practitioners and Midwives. All our doctors provide maternity care, mainly during ordinary surgeries, although most of the antenatal care is now undertaken by the midwife. Please tell the receptionist if you require an antenatal or postnatal appointment because a longer consultation will be necessary. There is a Midwife attached to our practice and she usually sees patients at Danes Dyke Surgery on Wednesday and South Cliff surgery on Thursday afternoons. As a midwife care delivery your baby will be delivered in the hospital by a community midwife. The early part of your labour will be monitored at home. This means that your stay in hospital will be for a relatively short time, usually between six and forty eight hours. This service is usually offered to women in their second or subsequent pregnancy. The majority of women do not seem to want to have a home delivery, but this is an option open to you if you wish. You will be able to discuss the type of delivery you require when you attend for antenatal care with either your Doctor or the Midwife. As part of the Child Health Surveillance programme for children under the age of five years, your child will be offered regular checks with either your Doctor or Health Visitor. These start with the six-week baby check which is carried out by the Doctor at the same time as the mother's post-natal check. The Health Visitor then continues to check your child’s early development at regular stages. At the age of three and a half years you will be invited to bring your child to the surgery for his/her pre-school check with the doctor followed by an appointment with the Practice Nurse for vaccination. We see patients for emergency contraception or advice, please ask at reception to see the Practice Nurse. As with all our medical practice this is a completely confidential service. We offer a full service, including the fitting of intra-uterine devices (coils) and the fitting of subcutaneous contraception (Implanon). In addition our practice nurses will see patients for contraceptive advice or for annual checks. All our Doctors are able to carry out minor surgical procedures, typical operations being the removal of sebaceous cysts and small non-malignant skin lesions. We also have the facility to freeze treat troublesome warts, without the need for referral to hospital. A cryosurgery clinic is held monthly on a Wednesday afternoon, at Danes Dyke Surgery from 5.00 to 5.45 pm, for the treatment of these warts and other minor skin conditions. Our Practice Nurses see patients for health promotion at various times during the week. These clinics include well person checks, diabetic checks, asthma checks, hypertension checks, heart disease checks and travel advice. Patients who wish to give up smoking may access the community services available locally. Please visit the website http://smokefree.nhs.uk/ for further information. The surgery no longer provides an in-house smoking cessation service and does not prescribe smoking cessation medication. 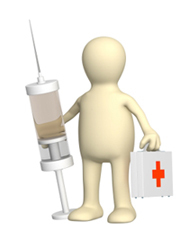 After five Tetanus injections individuals usually have immunity. All young adult women should have been immunised against rubella. We recommend that you protect your children by having them immunised against the following infections: DIPHTHERIA, TETANUS, WHOOPING COUGH, POLIO, MEASLES, MUMPS and RUBELLA, Haemophilus Influenzae (HIB), MENINGITIS C and PNEUMOCOCCAL. Only rarely and in special circumstances should these immunisations be omitted. Our Doctors, Practice Nurses and Health Visitors will be pleased to advise. School leavers (aged 15+) should all have a tetanus, polio and diphtheria booster. Girls aged 10 should be immunised against rubella (German measles) if they have not had the MMR immunisation. TB immunisation is normally given to people in ‘at risk’ areas and is not given at the surgeries. These vaccines last 10 years, so if you know you are due to go on holiday to a area in the world which would require yellow fever immunity why not book your vaccine sooner rather than later. Contact reception at our Danes Dyke branch to arrange your appointment with the practice nurse. Some travel vaccines are only available as a private service and therefore incur a charge. It is important to make this initial appointment as early as possible - preferably 8 weeks before you travel - as a second appointment may be required for further vaccinations. Even if you are travelling at short notice it is still necessary to make an appointment with the practice nurse to see if any vaccines can be administered, although ideally vaccines should be given at least 2 weeks before you travel to allow the vaccines time to work. Some vaccines need to be ordered as they are not kept in stock. Drugs may be purchased privately to take on holiday in case of illness (eg antibiotics); further details on request. REMEMBER TO TAKE WITH YOU ANY MEDICATION YOU HAVE BEEN PRESCRIBED FOR EXISTING MEDICAL CONDITIONS. YOU MAY NEED A LETTER FROM YOUR DOCTOR WHEN CARRYING CERTAIN MEDICINES. A BASIC FIRST AID KIT CONTAINING ELASTOPLAST, SIMPLE PAINKILLERS, ANTISEPTIC CREAM, INSECT REPELLENT ETC MAY BE USEFUL WHILE ON HOLIDAY. Travelling to some holiday destinations can bring risks to health, but with care you can minimise exposure to most health hazards. Cover your head, especially if hair is thinning. Wear loose fitting, closely woven clothes. Protect your eyes with good sunglasses. Avoid the sun between 11 am and 3 pm when strongest and most likely to burn. Use high factor sun creams (greater than factor 15). These will filter out some of the UVA rays, which cause ageing, and UVB rays which cause burning. Children’s skin is especially vulnerable. Sunburn in childhood can lead to skin cancer in later life. Keep children in the shade, protect them with suitable clothing, a hat and high protective sunscreens. Take them indoors, out of the sun immediately. Shower with cool, not cold, water and apply ‘Aftersun’ or calamine lotion. If the child has serious burns or is unwell seek medical help. Wherever you are in the world be careful about what you eat and drink. Food and water may be contaminated in many ways. If you are unsure about the water supply do not use it for drinking, cleaning teeth, washing food or ice making. Use bottled water (checking the seal is unbroken). Swim only where the water is clean and safe. Sea, rivers and lakes can be contaminated. Always wash your hands after visiting the toilet and before handling food. Sexually transmitted diseases are a serious threat to health throughout the world. Condoms offer some protection against them so take a supply with you. Some tropical diseases are spread by insect bites. Protect yourself with repellent creams and sprays; cover arms and legs when walking in wooded areas, long grass and by still water. Animal bites are painful and can become infected. Be wary of touching any animals. If bitten, wash the area thoroughly with clean water and seek medical advice. If you become unwell after returning from abroad do not forget to tell your doctor that you have been out of the UK and which countries you have visited. If you have been taking anti-malarial tablets remember to continue for the recommended time after your return. Private Fees - Patient Leaflet: This leaflet is also available from reception at Danes Dyke and South Cliff and we hope provides information on fees charged for standard requests. If your request is not listed in this leaflet or you are unsure whether it’s listed you will need to make contact with the reception team to discuss further. Private Fees – Private Service Arrangement Form: This form is the form our staff on South Cliff and Danes Dyke reception desks will complete with you when you bring in any forms or requests to be filled by us which may incur a private charge. If you are able it might be worth you downloading the form and completing any blanks that you can before attending the practice to submit the request. This will help speed up the process. Private work (work which is not covered under our NHS contract) is treated as routine in all circumstances and priority is always given to our NHS related workload. We appreciate that requests may be important to you and whilst we will do our best to honour any requests you have within the timescale you require them in, we cannot be held by deadlines in these circumstances and cannot provide guarantee. For this reason it is in your interests to provide us with as much time as possible to allow for processing. If you do have deadlines please discuss this with the receptionist and they may be able to give you an indication as to whether it might be possible to fulfil. We will of course endeavour to provide the high level of quality and service to which we believe our patients have become accustomed to and deserve. * please be aware we are unable to disclose third party information without their consent such as letters relating to care provided by other agencies. Eligibility for treatment is not defined by nationality, payment of taxes, NI etc but based on residency. If you are ordinarilary resident in the UK (see below for definition) you are eligible for free treatment. If you are a visitor then you may have to pay – see the section on overseas visitors. Ordinarilary resident – living in the UK for 90 days or more in a year. Under the current Regulations, anyone who comes to the UK on holiday or for a short term visit will have to pay for any NHS hospital treatment they may need while they are here, unless they meet the criteria for one of the exemptions from charges. This includes people coming to visit relatives who are ordinarily resident in the UK. Their entitlement to free treatment does not extend to you, even if you are going to be staying with them for several weeks or months. If you think you will have to pay for treatment, you are strongly advised to take out health insurance before you travel. The following exemptions from charges apply to hospital treatment. compulsory treatment under the terms of the Mental Health Act 1983, or psychiatric treatment included by the Court as part of a probation order under the terms of the Powers of the Criminal Courts Act 1973. In all cases, these exemptions extend to the spouse and school age children of an exempt person if they are living in the UK with the exempt person on a permanent basis. a person who is serving with the armed forces of a country which is part of NATO but only where treatment cannot be readily provided by either his or her own medical service or the UK armed forces medical service. an authorised companion (which need not be spouse) of an individual who has been designated exempt by Secretary of State on exceptional humanitarian grounds. The Secretary of State can designate an individual exempt from charges on exceptional humanitarian grounds as long as certain criteria are met. Plus Iceland, Liechtenstein and Norway. Switzerland by special arrangement. • Turks and Caicos Islands.